Samsung sells 1 million Galaxy Tabs | Android Blast! Samsung has announced that it has sold 1 million Galaxy Tabs in just under 2 months. It is not clear whether the 1 million number is the actual number sold, or the number shipped to retailers, but either way it's an impressive number. Just a couple weeks ago Samsung said it had sold 600,000 units but now they're on a roll. Samsung has now upped their 2010 projections to 1.5 million units and 2011 looks to be a good year for the Galaxy Tab. The Galaxy Tab is an Android tablet device that sports a 7-inch display, and runs Android on a 1GHz Hummingbird processor. 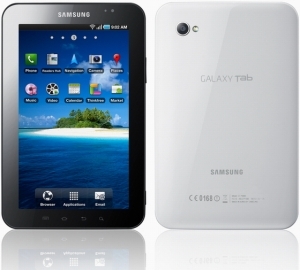 The Galaxy Tab has both front and rear facing cameras and is currently sold in 64 countries.